Her Universe and Fan Factory! Known to Star Wars fans as the voice of Ahsoka Tano on the Star Wars animated series, actress and entrepreneur, Ashley Eckstein, also founded fangirl fashion company and lifestyle brand, Her Universe. Additionally, she is the voice of Mia the bluebird on Disney's Sofia the First, Dagger on Disney XD's Ultimate Spider-Man, the voice of Cheetah on DC Super Hero Girls and was also heard on the big screen as the voice of Yaeko in the English adaptation of Studio Ghibli's beloved film Only Yesterday. A recognized personality in the "geek world" and an in-demand actress and host for Disney, HSN and more, Ashley now adds author to the list with the May release of her inspirational new book, "It's Your Universe: You have the Power to Make It Happen" from Disney Publishing. Married to former Major League Baseball player and World Series MVP, David Eckstein, Ashley and David reside in Orlando, FL. Rhysa Yannotti is the Associate Buyer for Licensed Women's Tops at Hot Topic. After landing her dream job at her local Hot Topic store back in Texas, she worked her way up in the company to HQ and recently celebrated her 11th work anniversary. (She's not kidding about HT being her dream job. She wrote a paper about how she was going to work at Hot Topic when she was in 6th grade.) Her love for all things anime started with Sailor Moon when she was in first grade and the first Studio Ghibli film she ever saw was Kiki's Delivery Service. Her passion for the studio resulted in her cosplaying different characters from their numerous releases and buying up any and all Ghibli related merchandise she could get her hands on. (She still remembers screaming about finding Spirited Away merchandise at Epcot on a school trip to Disneyworld in middle school.) She hopes to continue to funnel her passion for pop culture and anime into product for other fans to enjoy so they too can screech in delight upon finding a special piece in their local Hot Topic! Andrea Schwartz is the Licensed Apparel Designer for Hot Topic and associated brands having worked on licensed collections for Studio Ghibli, Sailor Moon, Square Enix, Harry Potter, Outlander among others. A graduate of Otis College of Art and Design's fashion program, they participated in the inaugural Her Universe Fashion show at SDCC 2014 and joined the Hot Topic team shortly after in 2015. Andrea is a dedicated anime nerd, cosplayer and suspected witch. Create an original piece of art inspired by Kiki's Delivery Service to be used on licensed product if the submission wins. Only designs pertaining to the characters, backgrounds and story elements form the film "Kiki's Delivery Service" may be submitted for this contest. Do not mix "Kiki's Delivery Service" elements with elements from any other film, show, or other content. Do not incorporate any other brands or product with Kiki's Delivery Service; they cannot appear to be endorsing another brand or featured with another brand. 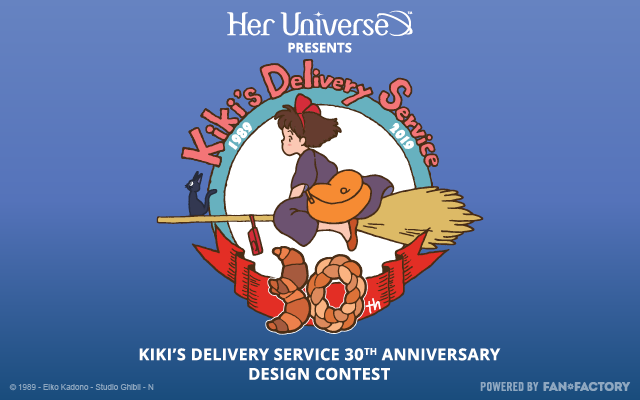 Kiki's Delivery Service 30th Anniversary Design Contest begins January 23, 2019 and ends February 19, 2019. Must be age of majority or older to enter and must be a legal resident of and be physically located in the United States, the District of Columbia or Puerto Rico. One (1) grand prize winner will win $2,000 and no fewer than four (4) runners up will each win $300. Ten entries per person during the Contest Period. Total ARV of all prizes is $3,200. Void where prohibited. See Official Rules for additional eligibility restrictions and complete details. Sponsored by Hot Topic, Inc. and BoxLunch 18305 E. San Jose Ave, City Of Industry, CA, 91748 United States ("Sponsors") and administered by Fan Factory ("Administrator"). 1. CONTEST SUBMISSION PERIOD: Submissions will be accepted starting January 23, 2019 at 12:00:00 am Pacific Time ("PT") and ending February 19, 2019 at 11:59:59 pm PT (the "Contest Submission Period"). Voting will take place February 20, 2019 through February 26, 2019. The judging will take place beginning on: February 27, 2019 through March 8, 2019. Merchandising, or Studio Ghibli ("Licensor") or their respective parents, affiliates, subsidiaries, franchisees, or service agencies; (b) individuals engaged in the development, production or distribution of materials for the Contest or engaged in the administration or execution of this Contest (all such individuals and entities in (a) and (b) collectively referred to herein as the "Contest Entities"), and (c) persons who are or purport to be immediate family members (defined as biological or step-mother, father, sister, brother, daughter, son, dependent or spouse of any of the foregoing, regardless of where they reside) of any person in any of the preceding categories, regardless of where they live, or who reside in the same household (i.e., live in the same household for at least 3 of the 12 months preceding the start of the Contest Submission Period, whether related or not) as any person in any of the preceding categories. This Contest is subject to all applicable federal, state, and local laws and regulations. Void where prohibited. Licensor is not responsible for the collection, submission or processing of entries, the selection of winners, the provision or delivery of prizes, or the administration of the Contest. HOW TO ENTER: During the Contest Submission Period, enter online by downloading the submission kit and digitally uploading up to ten (10) designs at http://kikisdeliveryservicedesigncontest.fanfactoryart.com. Please click if you would like to download a submission kit. In order to submit, contestants must visit the submissions page during the Contest Submission Period and follow the on-screen instructions to upload their original artwork and complete an official entry form, including agreeing to the terms of the user generated content submission agreement ("Submission Agreement") and click the "Submit Your Design" button to complete the submission form. The uploaded original artwork together with the Submission Agreement and official entry form shall be collectively referred to as the "Entry." No more than ten (10) entries per person will be accepted. All online entries must be received no later than 11:59:59 PM PT on February 19, 2019. Attempts made by the same individual to enter by using multiple e-mail addresses/social media accounts or otherwise will be disqualified. Mass entries, or entries generated by a script, macro or use of automated devices will be disqualified. Winning designs may be used on product and featured in Hot Topic/BoxLunch stores and websites in accordance with the Additional Conditions of Entry set forth in Section 7 below. From February 27, 2019 to March 8, 2019, a panel of qualified judges to include representatives of Sponsors will judge all of the eligible Entries received during the Contest Submission Period and will select one (1) winner and four (4) runners up based on the judging criteria described below. Judging Criteria: (each criterion is followed by its weight in parentheses) submissions digitally uploaded to http://kikisdeliveryservicedesigncontest.fanfactoryart.com must depict the character(s) from the Licensor franchise Kiki's Delivery Service. Submissions will be judged based on (a) Creativity (25%), (b) Originality (25%) and (c) Fits the theme (50%). In the event of a tie, an additional, "tie-breaking" Contest Judge will determine the winning Entry based on the criteria listed herein. The potential grand prize winner and runners up will be eligible to win the prizes described below subject to verification of eligibility and compliance with these Official Rules. The Contest Judges' decisions shall be final and binding. 6. WINNER NOTIFICATION: The potential winners will be notified via email beginning on or about May 15, 2019 with instructions on how to be confirmed as a winner and claim their prize. The potential winners will be required to execute and return an affidavit of eligibility, a liability release, a certificate of authorship documentation assigning all rights, copyright, title and interest in the Entry to Licensor (the "COA"), a W9 form, and, where imposing such condition is legal, publicity release, within the time period specified by Sponsors. Failure of any potential winner to complete and return any of the aforementioned documentation within the allotted time period specified by Sponsors shall result in such potential winner's disqualification from the Contest. If a potential winner is found to be ineligible or not in compliance with these Official Rules, declines to accept a prize, or Sponsors are unable to contact a potential winner within three (3) business days, or in the event that a prize notification or prize is returned undeliverable, the prize will be forfeited and, at Sponsors' sole discretion, prize may be awarded to an alternate potential winner. Potential winners may be required to furnish proof of identification. If a winner's entry is accepted for use by Sponsors and Licensor, the winner hereby irrevocably, in perpetuity assigns any and all rights to the entry to Licensor including all copyrights. This means that the winner will no longer own the copyrights to that artwork. 15. For any legally required notice of the prize winner, send a self-addressed postage stamped envelope to: Kiki's Delivery Service Design Contest – Winner List Request", 18305 San Jose Ave, City of Industry, CA 91748, to be received by December 31, 2019. Winner's notice will be sent after all prizes have been awarded. Q: I see people cheating. What should I do? A: Please email FanFactoryArt@hottopic.com detailing what you are suspecting. The more details you can give, the better we can make our decision.